Bangkok is a rough time if you don’t like noise, people, beer, lights and general chaos… However, if you do it’s an experience worth having. Me and two mates (Chip from the US and Soloman from Scotland) decided to go for a bugs and temples day which would start out with temples in the morning and then later bugs in the evening. I’d looked up a couple of temples that I thought interesting and dotted them into Google Maps so with those we had a general plan. Soloman had to switch hostel and since most of the temples were in that vicinity, we jumped in a cab got him checked in at the new place and started walking towards the temples. We saw the Royal Grand Palace and it is incredibly large. We got 4 tickets at the entrance and only ended up using one. 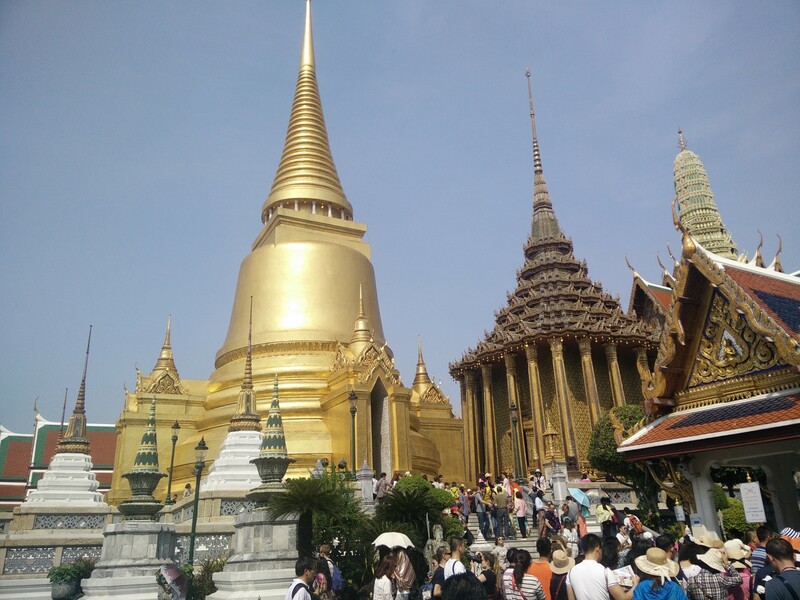 After walking around in the sun for a couple of hours without food or water we got to a point where we’d seen enough Grand Palace. It’s amazing but also huge so after seeing the emerald Buddha we left to get some water. One part of the Royal Grand Palace. The palace is huge! 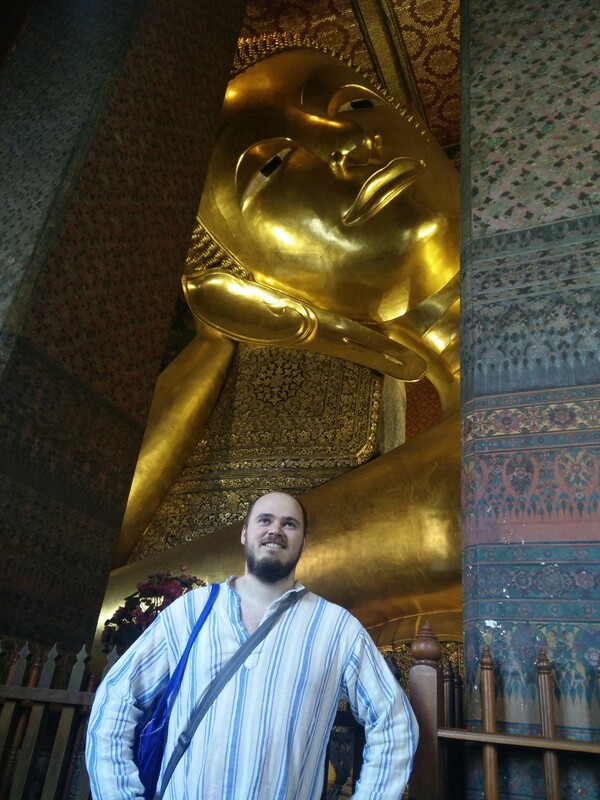 Next stop was Wat Pho which is where the Reclining Buddha is at. It’s a massive gold Buddha located inside the temple. It’s called the Reclining because of the very relaxed position the Buddha is assuming. Definitely worth a visit. Final stop was Wat Arun. Unfortunately, it was closed for renovation but we did get to cross a river using a local boat. It was an interesting experience since the river is completely filled with boats – large, small and even a tugboat with a barge was coming through. A bit chaotic but we managed to get across. And as it was only 2.5Baht (7 us cents) there is not really any room for complaining. The area around it was very interesting and we did manage to get lost, suddenly ending up in a school area surrounded by thai kids in uniforms and some very small local streets. So even though the temple was closed, the trip across the river most certainly was not for naught. After visiting Wat Arun we were all tired and needed food and rest after a full day of walking in the sun, so after watching a free Muay Thai fighting match for about 15 mins (the match ended with a brutal KO), we got back to my hostel. Every day there would be someone sitting out on the terrace in front of the hostel having a beer and today was no different so we quickly joined them. This lasted the next 4 hours from around 8pm to 12pm, the same as every day, as this is when the hostel stops serving alcohol. During this time, I managed to get some food and an hour of sleep too so that I was a bit more rested. I still hadn’t gotten to eat bugs yet and I was determined not go to bed before tasting bugs. Around midnight we all grabbed a cab to a place called Nana Plaza in the city center. It’s the second most party street of Bangkok but not really that appealing. It’s characterized by a lot of old white people walking the streets, overpriced beer and working girls everywhere. It’s a place you can visit once and then the charm goes off pretty quickly. Debauchery and gluttonous indulgence at its finest so we only stayed for one beer. As I was anxious to get a bite of some zesty bug I convinced the others to make the next stop a street food vendor around the corner that we saw on the way in. The bugs as you see them above are not as bad as they look. The easiest bugs to eat are the little white maggots as the taste resembles salted chips. The crickets (both large and small) have the same taste but the legs are annoying as they are hard to eat and get stuck in your teeth. I later learned that the trick is to hold the legs and eat the rest – just like you would not eat the tail of a shrimp. The beetles were the hardest as the hard shell makes for a very inconvenient bite to eat – not a single one of us managed to eat one without spitting it out. However, we later learned that the way to eat them is to peel the shell off and only eat the inner part of the bug. This makes sense and would certainly be easier but it’s hard work for very little food. All in all bugs were a very interesting experience and I was pleasantly surprised with the taste although I would probably steer clear of them if I had the chance to eat a good pad thai instead. 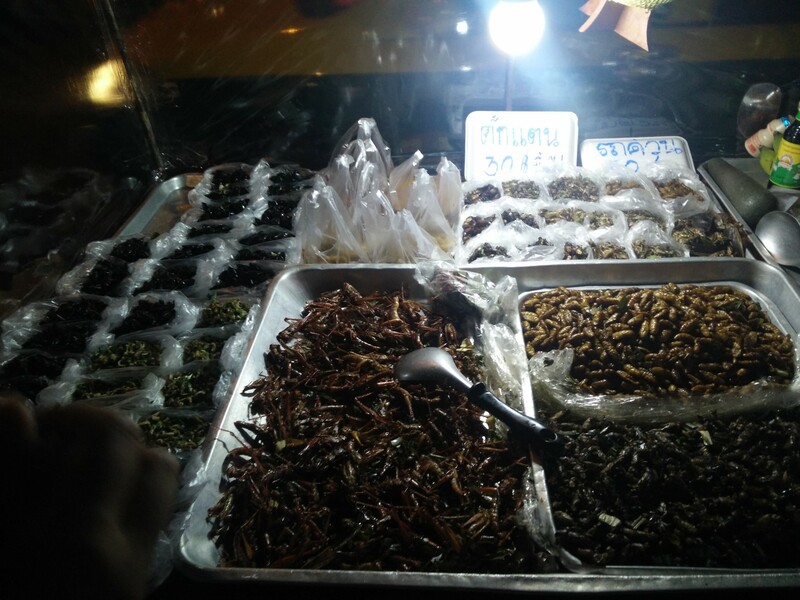 After the bug eating experience we went to Khao San Road which is the main party street of Bangkok. After a cab ride with a man that enjoyed breaking the law by going 120km/t while blasting through red lights, we made it. The night was just a “normal” Bangkok style party after this where we ended up in a disco dancing the night away until around 4:30am. By the end of the evening my MiFit watch told me I had moved around 30000 steps or the equivalent of about 13miles – the target is 8000 steps. 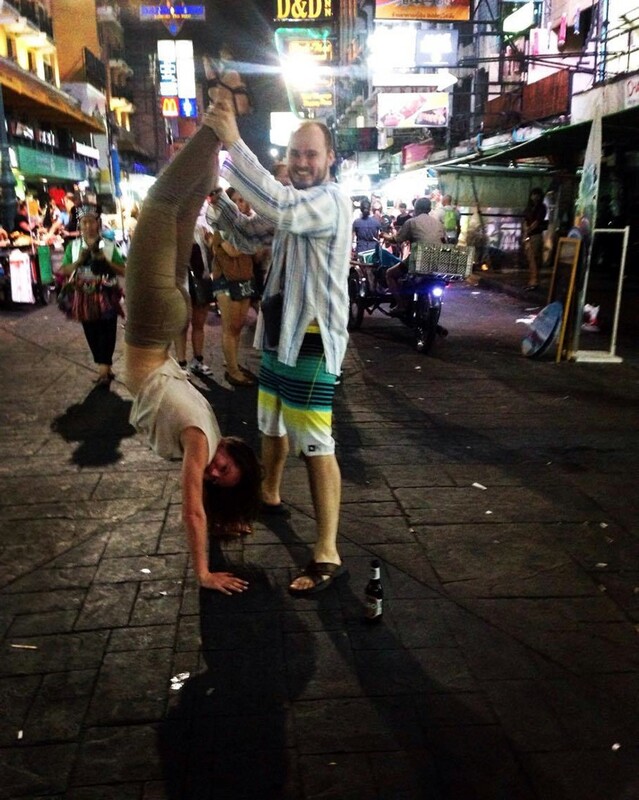 It was a rough day but included so much of what you can do in a city like Bangkok. Although I only had 3 beers total the entire night, it was quite a rough day/night and one I’ll remember. I also slept like a log that night.